Unique to Rye, the River Cafe offers a fully licensed 165 foot decked area on the rivers edge as well as one of the quirkiest interiors that Kent and Sussex have to offer. With 10 moorings, including visitor moorings, you can enjoy a meal at the riverside bistro if you are arriving from land or sea. The Rye River Cafe specialises in fresh fish bought straight from the fishermen, plus locally reared meat dishes. 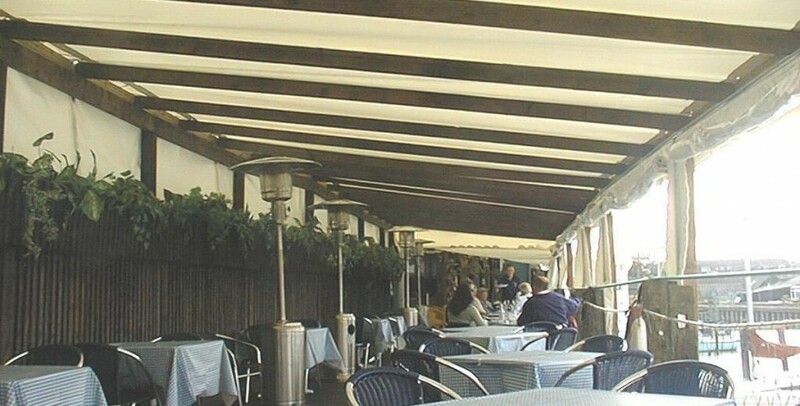 To design, manufacture and install a covered pergola on a river front wooden quay. The covers had to be easily removable and the structure must withstand the inclement elements and high winds that waterside location suffers. The existing wooden jetty was an irregular shape to cover and the pergola had to join onto an existing awning without leaks or draughts. Our solution has withstood gale force winds and snow … and is still going strong ! If they wish to remove the covers Allison pointed out how easy this was with the BARKERS Marquees’ solution – unlike their awning. This was anchored using steel tensioned cables and required specialist personnel (we helped them out!) to erect. In contrast the covers to our solution can be fed through an aluminium track fixed to the timber and pulled overhead – needing nothing more than a pair of step ladders, rope and long arms. The Pergola Marquee was custom made for Rye River Cafe. Due to the irregular shape of the existing wooden jetty each panel of the pergola was a different shape and had to be crafted piece by piece. Clear PVC windows ensure that the view is maintained during winter months and can be rolled up in the summer. The fabric used is UV stabilised, avoiding sun damage and anti-fungal, avoiding discolouration. The rough sawn wooden framework ties in with existing wooden jetty both physically and visually. By covering this jetty, Rye River Cafe nearly doubled their capacity, from 70 to 120 covers. The jetty area is a more informal and relaxed dining experience which is enjoyed by intimate gatherings. Allison says that the jetty particularly attracts dog walkers and smokers lounging over Sunday Brunch and the papers. The Pergola Marquee attracts people to the restaurant as it’s white covers and elevated shape stand out, particularly if you are viewing the shoreline from a boat. It has become a good advert for the cafe itself – literally its ‘flagship’. Allison Riche summed up her feelings by saying ‘ we couldn’t do without it. It is certainly value for money’. Customers love sitting under the covers, which provides shade on hot days and can be fully enclosed in the depths of winter. Which ever season it is you can still enjoy the beauty of Rye and it’s waterfront.